I agree. Since I was informed of its existence a couple of years back, I’ve tried to introduce as many people as possible to the glory that is the song “Dog Police,” by the band Dog Police, off the album Dog Police. Results have been mixed. Some people have loved it. Some have reacted to it by simply screaming for three minutes. Still others forget it exists until months later, when the chorus suddenly lodges itself in their heads while they’re mowing the lawn, after which it proceeds to loop morning, noon, and night for many days straight. The Dog Police are wondrous creatures, for sure. It wasn’t until recently, though, that I found out that they were the stars of a television pilot featuring goddamn Adam Sandler of all people. Yes, the song’s in there too, in slightly modified form. Why the change? Well, a helpful YouTube comment (something that by all means should not exist) points out that the original Dog Police lyrics totally rip off The Electric Company’s “Spider-Man.” And…well, yeah. Actually, they do. But I’m getting off track. My point in all this? Listen to the voice they gave the narrator, Bowser, and tell me if it doesn’t sound a little familiar. 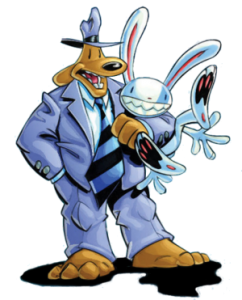 Now consider that Bowser is a dog detective with a voice similar to Sam Spade’s. He wears a coat, a tie, and a jaunty hat. I’m just saying, is all. Sam & Max creator Steve Purcell claims that he came up with the characters in his childhood, but these memories could very well have been secretly implanted by the Dog Police. This is the truth I choose to believe, anyway. It’s unknown what role McGruff the Crime Dog plays in the conspiracy, as he and the Dog Police came into existence at almost the exact same time. Hmm. If you’re interested in learning more about the Dog Police, check your local library, or buy the MP3 single from Amazon. Trust me, it’s worth every penny. This entry was posted on Saturday, June 19th, 2010 at 12:47 pm and is filed under Potpourri. You can follow any responses to this entry through the RSS 2.0 feed. You can leave a response, or trackback from your own site. OK, but where does Tail Concerto fit into all of this?